"The Nye Mets are my favorite squadron." In The A.V. Club’s journey through The Simpsons’ excellent seventh season, many of our previous reviews have pointed out that the season’s greatest strength is its focus on the relationships and the individuals that make up Springfield. However, what’s been lost in that focus is the idea of Springfield’s population as a collective whole, and their ability to come together—often in the absolute worst ways. Yes, this is the Springfield where everyone has a story to tell, but it’s also the Springfield where mob mentality runs rampant, and where riots can be sparked by a likeness of Jimmy Carter. The series returns to those impulses in “Much Apu About Nothing,” only this time the inciting factor isn’t history’s greatest monster, but rather the entire population of people who weren’t born in this country. Certainly one of the most political episodes of The Simpsons’ entire run, “Much Apu About Nothing” also manages to become one of the series’ most successful installments through a balance of the individual and the collective. Beginning as a ruthless skewering of mob mentality and political sleight-of-hand, the episode places a human face on immigration issues, transforming one of Springfield’s most broadly foreign inhabitants into one of its most sympathetic and intelligent. It’s also an incredibly funny episode, with at least a dozen eminently quotable lines—as you might expect from a script by David S. Cohen. In classic Simpsons fashion, this serious discussion is borne from a random source. A bear (or rather “a large bear-like animal, most likely a bear,” according to Kent Brockman’s ace reporting) is moving through the streets of Springfield without a care in the world. The episode goes out of its way to make the bear seem as non-threatening as possible: Between its slightly confused expressions and the horn-heavy score accompanying the bear’s lumbering, it’s clear the animal just wandered onto Evergreen Terrace. Everything that happens next is the fault of those in the bear’s path: Ned Flanders screams, crashes his car into a tree, and leaps through a window? 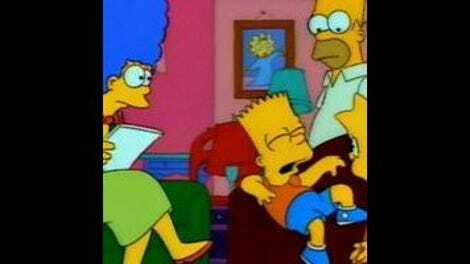 Homer swings across a power line and falls into his front yard, sans pants? None of this can be laid at the bear’s paws. Indeed, its only target is a mailbox, and all that means is bad news for the Impson family. That fact is entirely lost on Mr. Impson and the rest of Springfield’s residents, who form an angry mob and storm into Mayor Quimby’s office, demanding protection from ursine violence. Quimby responds with the Bear Patrol, a task force employing everything from buses to stealth bombers. The cost? Only $5 per paycheck. The result? The angry mob returns demanding lower taxes. (Mrs. Lovejoy serves as their Cassandra, going from the nondescript fussbudget of “Marge In Chains” and “Bart’s Girlfriend” to a immortal Simpsons gag with her increasingly hysterical plea for someone—anyone—to please think of the children.) Lisa, as always, serves as the lone voice of reason, but she’s unable to convince anyone that the bear patrol and the small tax increase are pointless. She’s able to turn a profit though, thanks to the best depiction ever of correlation not implying causation. It’s hard not to feel sympathy for Mayor Quimby in this position—at least, until he decides to show some “real leadership,” passes the buck by blaming high taxes on illegal immigrants, and announces the creation of Proposition 24 to give the city a chance to vote on mass deportation. Once again, the faceless mob is easily swayed by a new threat, and a wave of xenophobia rides into Springfield as residents like Uter and Groundskeeper Willie go from stereotypes to targets. It’s ugly in a way that the beloved ensemble of Springfield rarely is, with Moe turning his bar into headquarters for hate-speech and Principal Skinner degrading a student in front of his peers. Lisa tries to soothe the vitriol by pointing out that the Simpson family immigrated as well, only for Grampa to derail it with his own exaggerated version of the story, which ends with the Simpsons living in the Statue Of Liberty. While he reached new heights last episode with his Hellfish-related triumphs, the sequence is vintage Abe Simpson nonsense, and a great showcase for Cohen’s gift of stacking memorable gags on top of one another. As with any big issue, a personal angle puts everything in perspective. The human face of the immigration debate turns out to be Apu, revealed to be an illegal alien himself due to an expired student visa. 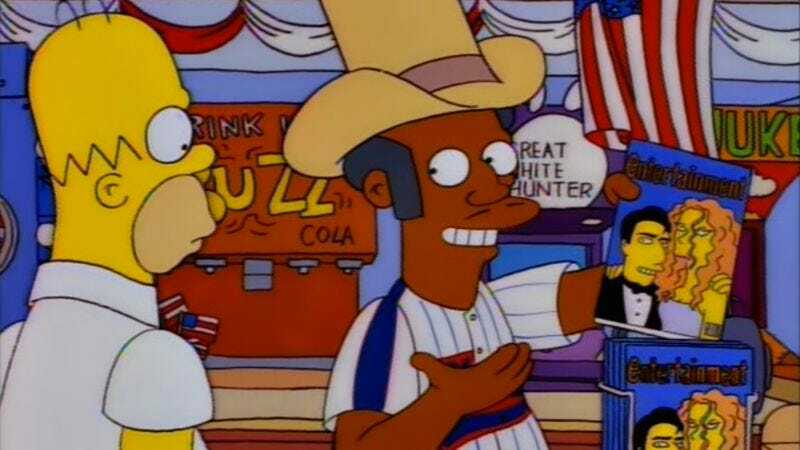 Of all the obvious foreigners in Springfield, Apu is the easiest choice to center the story around, as he already received a considerable amount of shading in season five’s “Homer And Apu.” “Much Apu About Nothing,” however, goes even further than that, and takes him from an insanely devoted Kwik-E-Mart employee to a real human being. It’s a quintessential immigration story: he’s far too intelligent to work a retail job (top of Calcutta Technical Institute’s graduating class of 7 million), too committed to leave the country that is his adopted home. Small wonder that Marge—and the audience—can sympathize with his position and his desire to maintain the life that he’s built. Why should he be kicked out for something as trivial as violating U.S. law? To save himself from deportation, Apu decides to violate a few more U.S. laws by purchasing a full portfolio of citizenship documents from Fat Tony. Taking the mobster’s advice, he decides to embrace his new role as “some yahoo from Green Bay,” and transforms the Kwik-E-Mart into a nexus of patriotism. There’s some spectacular work from Hank Azaria in this scene as he plays around with one of his most iconic voices: first the way Apu twists his thick accent into a forced casual attitude about baseball and Entertainment Weekly, and then in his expressions of raw shame and grief as the dead eyes of Tom Cruise and Nicole Kidman cut through his facade. The sharp difference between the two accentuates both, making the former funnier and the latter more poignant. “You must love this country more than I love a cold beer on a hot Christmas morning,” Homer realizes—a line former A.V. Club editor Kyle Ryan justifiably called “possibly the greatest Simpsons joke ever written”—and his energies are turned toward making sure his friend can stay in his new home. Homer gets his chance to look better at the party commemorating Apu’s victory, where he’s surprisingly the most eloquent speaker. (Poor Lisa is shot down one last time when neither Homer nor Apu understand what she means by Native Americans.) Homer’s behavior in the first half of this episode is pretty bad, but it all comes from a misinformed place rather than a malicious one. His explanation of what he’s learned—that immigrants are “the glue that holds the gears of our society” together—is one of the most earnest statements The Simpsons ever made, a moral amidst all the chaos. It seems to lead the city’s population out of ignorance right as Springfield citizens are poised to go to the polls, all casting their ballots, marbles, darts, and flushes to a chorus of “No on 24!” Has the town finally learned its lesson? No. Proposition 24 passes with a whopping 95 percent of the vote. Small wonder Homer declares that democracy doesn’t work. Democracy may not work, but the people who form the democracy are the reason why “Much Apu About Nothing” works as well as it does. It’s an episode about how everyone overreacts to an outside force, be it “hibernating hucksters” or a faceless law that removes them from their home. There’s hypocrisy from the worst of them (Moe’s protest-too-much attitude hiding his own citizenship woes) and the best of them (Apu’s tearful joy at and subsequent discarding of a jury duty notice). It’s an episode that knows there’s no easy answers to big questions, and it focuses on the large and small of those people caught up in those questions—a move that cements it as yet another Simpsons season seven triumph. Honorable mentions in Simpsons signage: The various anti-immigrant signs penned by Springfield residents. “Get Eurass Back To Eurasia,” “United States For United Statesians,” “The Only Good Foreigner Is Rod Stewart,” “Homer Say: Get Out.” Amusingly, the last one is still being carried around after Homer’s renounced his support for Proposition 24. Apu attended the Springfield Heights Institution of Technology. On the episode’s commentary track, Cohen and Groening are very proud of sneaking that one past the censors. While the episode makes Apu notably more human than he was in “Homer And Apu,” his capitalist Kwik-E-Mart sensibility still prevails. Not only does he carry Proposition 24 buttons in his store for $3.00, he only offers store credit for their return. Next week: Erik Adams goes on tour with the Smashing Pumpkins, Cypress Hill, and Sonic Youth for “Homerpalooza.” He’s got a message for Jimi Hendrix: pick up your puppy!